Indian e-commerce market, which was pegged at $53 billion for 2017, is expected to cross #100 billion in 2020, or sooner. While there is a push towards increasing more mobile Internet users, and the hyper localization of markets on the one hand, Indian e-commerce companies also faces stiff competition beyond just online shopping platforms. The fight between e-commerce giants such as Flipkart and Amazon is multi-faceted and more complex than what appears to be a numbers- game. E-commerce companies themselves vie for a big share in Omni-channel retail, payments, fintech, social networks, and even cloud-based services. The story on the other side of the Himalayas is in many ways similar, however it is the “walled gardens” structure of the Chinese e-commerce and Tech ecosystem that makes it fundamentally different. The Chinese e-commerce and online consumer services ecosystem is exploding beyond anticipation. Total revenue from e-commerce in China is expected to grow to $840 billion by 2021 – which would be twice that of the US, according to Statista Digital Market Outlook, 2016. It is an interesting e-commerce market to watch and learn because things do change fast in China. They really do! The action on the e-commerce front had extended to mobile back in 2014-15 itself. In fact, one can say the e-commerce revolution in China was actually mobile-first, with checkouts happening on mobile apps of Taobao, TMALL and JD.com since the early years of this decade. Come to 2016, and checkouts started happening within WeChat platform itself, and social e-commerce models like Pinduoduo have begun to gain ground. China is perhaps to the only market where concepts like “conversational commerce” or “messaging commerce” have become an everyday reality. What is noteworthy is that the changes are happening in much faster pace than ever before. JD.com took as many as 10 years, and Alibaba’s Tabao took about 5 years to reach 100 billion RMB (Yuan) in gross merchandise value (GMV). The recent phenomenon Pinduoduo took only two years to reach the same number. Clearly, the pace of a new entrant causing disruption is much faster. Numbers from ‘Singles Day’, China’s own version of Black Friday would give some solid perspective. Alibaba alone posted sales of $25.3 billion of gross merchandise volume (GMV) during Singles Day, which itself is about 2.5 times the total sales of Black Friday and Cyber Monday combined in the US. For many top apparel retail brands in China, anywhere between 40 to 80 percent of their online sales come from TMALL, and the rest from other players. This clearly establishes the fact that online marketplaces are not differentiators, but a driver of growth for retail in China. The walled gardens of Chinese e-commerce ecosystems: Goliath and Goliath! In the absence of Amazon and Google in China, the top-two major ecosystems, Tencent and Alibaba have evolved into all-pervasive platforms that serve the entire spectrum of a consumer’s e-commerce needs, trying to lock customers into their ecosystems. Spanning online shopping, retail chains, e-payments, financial services, social networks, cloud services, music and culture, news media, ridesharing platforms, delivery services, and even gaming, their empires are whole worlds by themselves! For instance, a customer who sees a product recommendation on Tencent’s WeChat messaging platform, seamlessly switches to Tencent’s JD to purchase it. On the other hand, (or rather on the “Ali side” of things), the same consumer might click on an advertisement on Youku (China’s YouTube), and purchase on TMALL. AliPay and WeChat Pay are head-to-head in mobile payments, with market shares of 54 percent and 40 percent respectively. AliPay holds the edge, as they are used more on checkouts on TMALL and Taobao. The two giants have also invested heavily in cloud services (though not as mature as Amazon Web Services), music streaming, culture, news, and gaming platforms and services. They have even locked horns in bike rentals, as Mobike and Ofo are affiliated to Tencent and Alibaba respectively. It is therefore the complementarity within each ecosystem, as well as the “walled gardens” that exist between them that drive competition. A fundamental difference between China’s Alibaba and India’s Amazon and Flipkart is that Alibaba willingly opens up its platform to share customer data with merchants. Alibaba also allows brands to run loyalty programs on its sites TMALL and Taobao, opening up a ‘data marketplace’ where merchant brands join hands with Alibaba to run engaging, gamified loyalty programs. This helps combine a customer’s offline and online user journeys and experience for maximum personalization and engagement. The aim of such sharing is clearly to make TMALL a destination for ‘product discovery’. In being so, Alibaba wishes to be the Google, or in China’s case, the Baidu for all online shopping by effectively retaining search traffic. The eventual sale might happen online or offline as the brands are enabled with data. 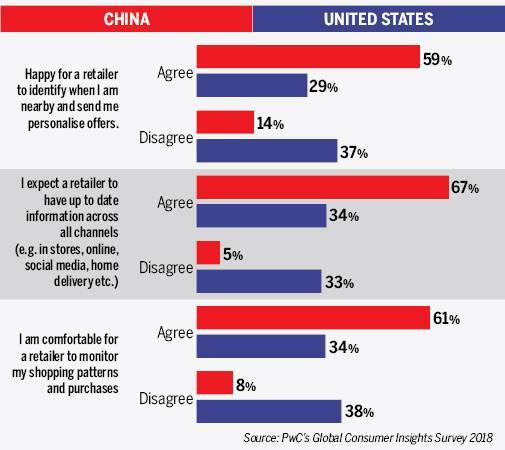 According to PwC’s global consumer insights survey of 2018, Chinese consumers are much more willing to share data and have high expectations that they will receive personalized experiences because of it. The survey states that 59% customers (vs only 29% in the US) are happy to have a retailer identify them when they are hanging out near stores, and target them with personalized offers. A further 67% (vs 34% in the US) expected retailers to have up-to-date omnichannel data about their purchases. As we move towards the end of the 21st century, newer models are evolving and customers are benefiting from it. With checkouts already having started to happen within WeChat itself, and social-group-buying models like Pinduoduo, which is China’s fastest growing Social e-commerce App. Things change FASTER in China! When the dragon rises high, can the elephant afford to sit and watch? Indian e-commerce battles are probably already closely watching and learning from what’s going on in China. Whether the Indian ecosystem itself evolves and matures with such “duopoly” characteristics is something time will tell. However, one learning from the Chinese story is that for an ecosystem to be mature, it has to be led by 2-3 players who dominate and drive the conversation – both online and offline. The author is a general manager & Business Head in Capillary Technologies, China & North Asia.